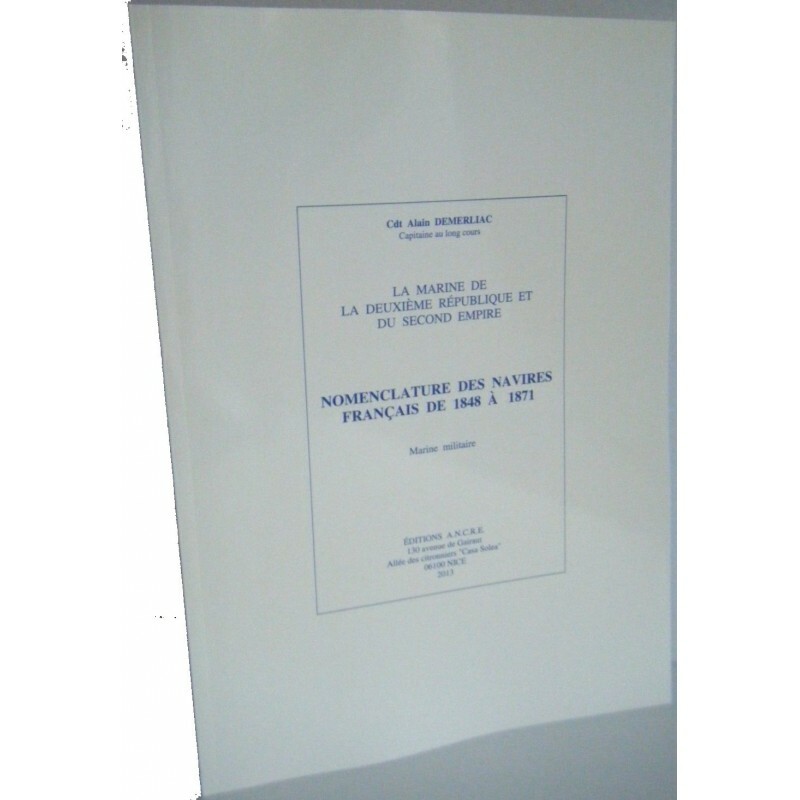 This directory of French merchant ships of the Second Republic and Second Empire follows the previous 8 "Nomenclatures" of Navy ships published since 1992. 1. The list of about 5,000 French merchant vessels and large fishing vessels that were in operation between 1848 and 1871. These buildings are classified chronologically by place of construction. French and foreign military ships that were built in France by private shipyards are mentioned for the record. For each vessel the information given is as follows: the type of sails, the date of entry into service, the gauge, the main dimensions if known and the name of their successive owners. The sailing ships of this period were often sold and resold. 2. The list of the 280 main French shipowners in activity from 1848 to 1871, with the enumeration of their ships during this period. 3. An alphabetical index of the French merchant ships listed in this book. During this period the French merchant navy has constantly developed, following the economic activity of the country in progress through the use of steam engines, gas and electricity. Ships took advantage of these technical improvements with the construction of wheeled and propeller ships and iron hulls. The sailboats participated in this evolution with the clippers who adopted better forms of hull and large sail surfaces. Only whalers saw their activity decline, whale oil used by urban lighting is gradually replaced by the use of electricity and gas. At that time there were the creation of a dozen major French shipping companies that lasted more than one hundred years: CGM / Transat, Messageries Maritimes, Delmas-Vieljeux, Fabre, Fraissinet, Pack, SGTMV, Maurel and Prom , Chambon and the Compagnie de Navigation Mixte. The long-awaited reference work is a welcome addition to our maritime literature. 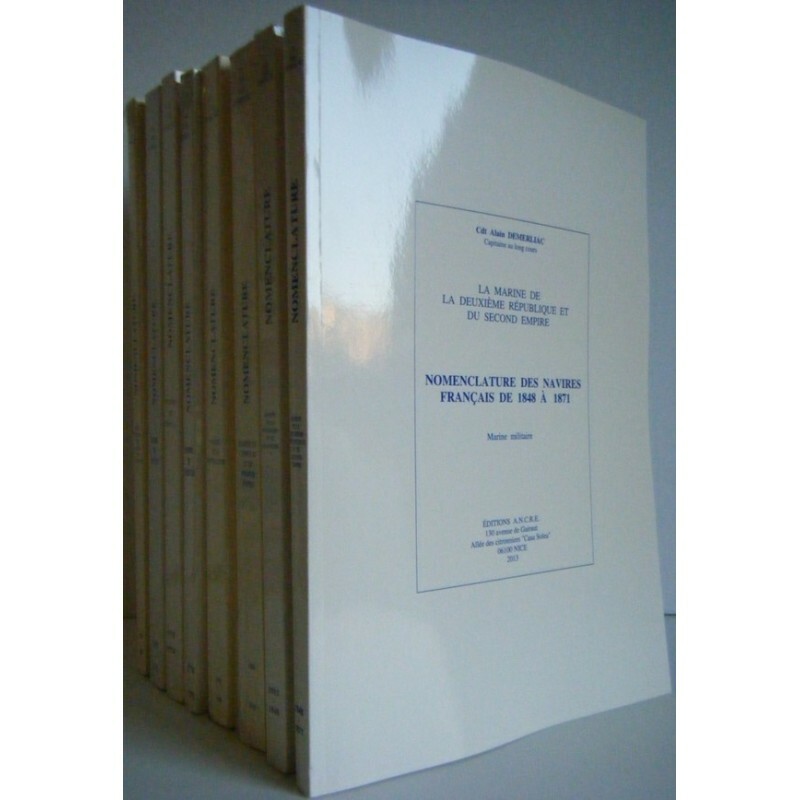 With the exception of the REPERTOIRE DES NAVIRES DE GUERRE FRANÇAIS (The Index of French Man-of-wars) by Pierre le Conte (Cherbourg 1893) and the REPERTOIRE DES NAVIRES DE GUERRE FRANÇAIS edited in 1967 by the Association des Amis des Musées de la Marine (the Friends of French Maritime Museums Association), based on the work of Jean Meirat - both incomplete and summary works - a solid reference work that catalogued all ships of the French navy did not exist until now. This need has been met by the four catalogues by Cdr. Demerliac which we are pleased to offer here. The culmination of Cdr. Demerliac's work, the result of over 30 years of exhaustive research, is fully revealed in the table of contents. The catalogues address not only the military fleet but also the mercantile navy (within the limitations of available source). The excerpt from one of the reference cards reproduced below demonstrates the seriousness and importance of the information provided in each volume. If the name of the ship is known, it will be listed in a general index found at the end of each volume. 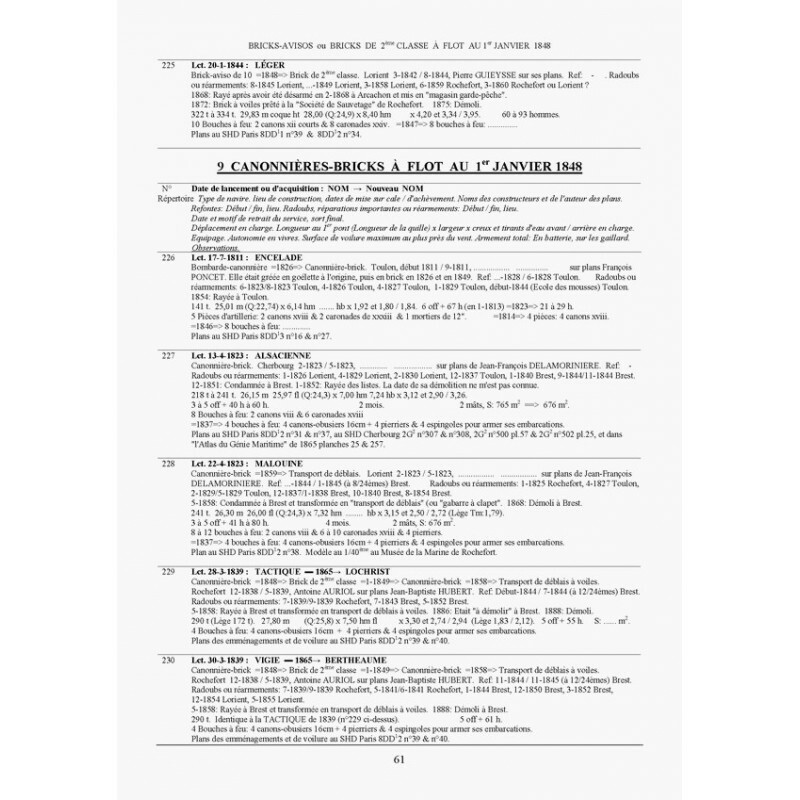 This directory of warships of the Second Republic and the Second Empire follows the previous seven "Nomenclature " published since 1992 that lists the key dates and characteristics of French ships from 1610 to 1848. 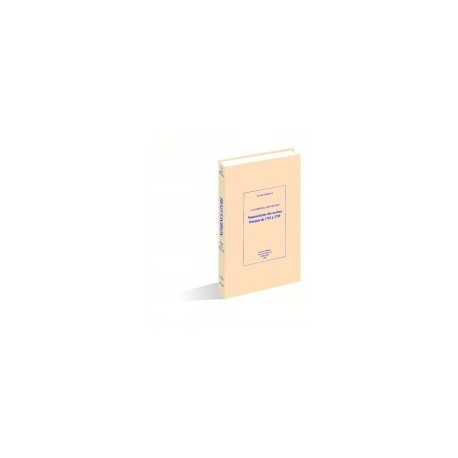 This 250-page book devotes a section to each ship plans indicating the author , place and dates of construction , possible revisions and briefly describes the circumstances of the end of the building. Are then registered tonnage , size , style and power of the machine, maximum speed, autonomy, number of crew , weapons and reference books to see drawings or pictures the vessel concerned. These vessels are classified by type and date of construction. 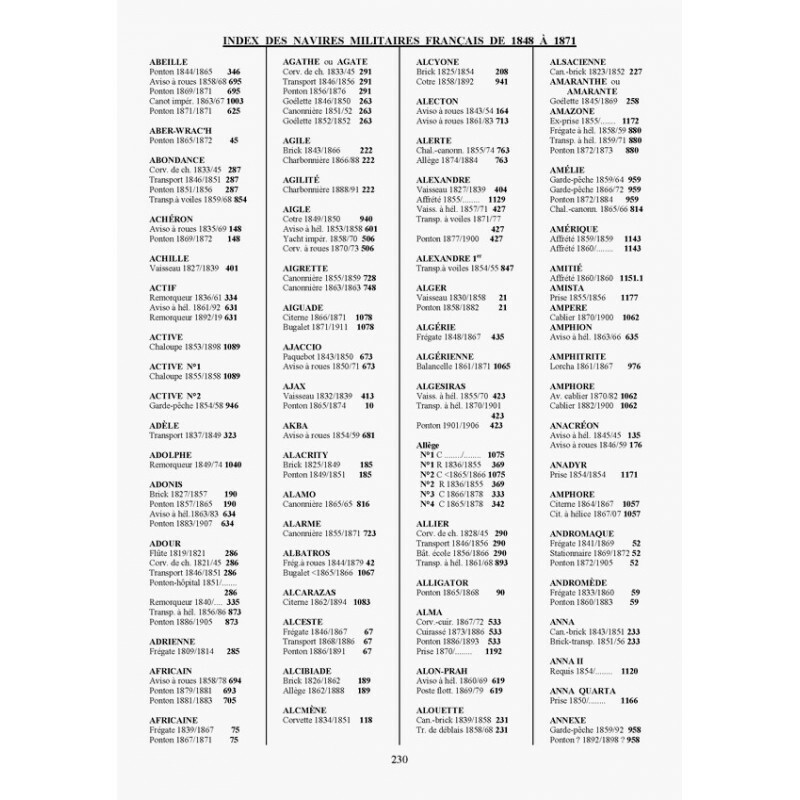 The last pages of the book provide a comprehensive index of vessels cited by classifying their names in alphabetical order which allows you to quickly find the section on building. The period 1848/1871 is characterized by a very rapid evolution of technology devoted to naval construction. A second volume , under development , will speak merchant ships used during the same period by the major French shipping companies have experienced so much growth with competitive sailing and steam and continuous improvement techniques . For its respective period, each catalogue lists all ships in the King's Navy at the beginning of the period and also those ships built during the period.